Excellent! Bang for the buck! The GalaxyBoard is a fun hands free scooter made out of high quality parts and it is built to live a long life packed with hours and hours of fun. It has an amazing price, and you get more than you pay for. Only 100$ more expensive than the cheapest self-balancing scooter available and compared to this scooter that one is made for babies. This is a rock solid, high speed, safe scooter that will fit anyone and for any need. It is better than the IO Hawk and Phunkee together and for a fraction of the price this baby can be yours. If you are looking for a new scooter the GalaxyBoard will give you whatever you might need. So stop looking an put down an order for one of the most entertaining devices/toys available at the market. Speed, Like the GoBoard this is a speed demon. A 12 mph top speed that makes even the most advanced riders a little shaky. Price, This unit is our bang for the buck. Quality, It is sturdy and well built. It has reinforced wheels with aluminum covers. US shipping, is available but it might cost a little more. If you want yours fast then this is great if you can wait the price is a little bit better. Warranty, A 2 year warranty says a lot about a product and this one got it! Speed, The speed is the only Con we could find and it really isn’t a con either… It’s just a warning that it goes fast and you need to have respect for the speed of this hoverboard. Even before we made the order of this new board called GalaxyBoard – Self balancing hoverboard I have to say our expectations were high. We had heard from others in the business that this board is a well made, high quality, speed demon. 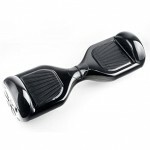 But also that it has a great self-balancing and turning technology making it easy to maneuver even for the first-timers. If you intend to find yourself a lower priced hoverboard you can take a look at the Hoverboost which might lack a bit in speed and distance compared to the Galaxyboard but it makes up for it in the lowered price tag. So we finally received the package and it has been tested hard all day long. We made a pressure test with 300 lbs on it and it moved just as usual. I guess it probably won’t hit the 12 mph top speed but it will probably get up to 10 mph without a worry. After that we wanted to test the speed. We clocked it at 12.3 mph and it felt super fast. The turning of the board at these speeds are fantastic. Some fast scooters might feel a bit sketchy at higher speed and you can feel very uncomfortable. This wasn’t the case with the GalaxyBoard. It delivered time and time again. You cant get enough of a fast and fun hoverboard like this. We rode it for almost the full 15 miles that is stated in the product details. It is sturdy and out of high quality, the wheel reinforcement is really helping to prevent nasty scratches and it has a neat and simple, yet stylish design. You can feel it just by holding it that this scooter has been built to last for years and that it is built for speed and hundreds to thousands of hours of fun. It is far more superior in quality and components than any of the other scooters we have reviewed except for our latest reviewed device the Robotturbo hoverboard which has a more speed, features and comes from a US brand. It might not be the lightest in the club but this ain’t a marathon, the lightest guy doesn’t win. If you have speed you got to have protection. That is where the reinforced aluminum covers on the wheels kick in. They prevent scratches from a curb, stones, and potholes. It is easily ridden on different terrain and it adjusts just perfectly. The battery is made by Samsung and it is of high quality and has a long life and the recharge time is only 1-2 hours giving you plenty of time to ride around on it. Overall we had a great day packed with lots of fun while testing the GalaxyBoard and we came to a conclusion that we might have a competitor for the GoBoard who earlier has been the best self-balancing scooter for quite some time. This one surely has potential, it may lack a few features that the GoBoard has but it also lacks around 140$ on the price tag making this a far cheaper alternative to the GoBoard. It has the same speed, distance, and qualities that the GoBoard has giving it a rightful 2: nd place. It’s a close call but you need a little more than just a better price to push yourself all the way to the number one spot. We recommend the GalaxyBoard Self-balancing hoverboard to anyone who might be interested. It costs about 70$ more than the cheapest alternative, but it has far higher speed and a 2 year warranty.